Here’s what this could potentially mean for you! 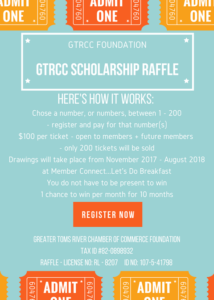 If all 200 tickets are sold – $20,000 will be collected – $10,000 will benefit GTRCC Foundation & $10,000 will be put in a pot to win monthly. $1,000 will be raffled off each month. The more involvement we have from our community the more successful this initiative will be! will open scholarship application mid November. If you have additional questions, please contact danielle@tomsriverchamber.com.